California based Indie Game Developer, Choice of Games, who brought you text-based games like Choice of Dragons and Choice of Broadsides, announced Friday that Yeti’s Parole is now available. Choice of Games has brought their multiple-choice interactive-fiction game to iOS (iPhone/iPad), Android, PC/Mac/Linux via the Chrome Web Store. In Yeti’s Parole Officer, players will take on the role of being a parole officer, where you will meet aliens like the Yeti, Loch Ness Monster, Chupacabra, and Mothman. These aliens have been sent to prison on Earth by the Pan-Galactic Prisons. Though just patrolling isn’t your only thing, you will need to make sure to defend the galaxy from these criminal aliens, discover what is going on behind all these criminals, what plans they are trying to do against the galaxy, and you must bring them to justice! ‘Yeti’s Parole Officer’ is by the Canadian author and podcaster KT Bryski, and being a multiple choice game, you control where the story goes and ends. This is totally text-based, so if you are into a non-graphic type of game/interactive sci-fi novel, then come and let your imagination go wild in this game! For example, at the Yeti’s parole hearing, the Yeti says that he’s ready for parole; he claims to have learned his lesson. What will you say? Explore the galaxy–from the rolling hills of New Zealand to treacherous alien backstreets. 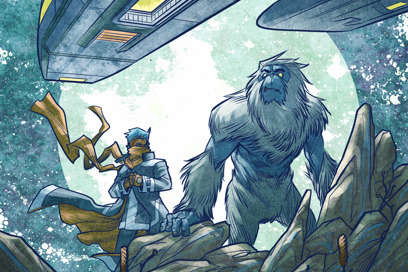 Track down infamous monsters and new alien species. Keep Earth safe from its alien convicts–or turn sides and join them. You can play the first three chapters for free but then you will need to download the rest of the chapters for Yeti’s Parole Officer for $1.99. You can follow Choice of Games on Twitter and like them on Facebook for any updates on the game and any games to come.